KGB Security Locksmiths are committed to providing top notch security options for even the most troublesome issues. Our skilled team of chosen experts know the importance of working together. In 1988 we saw the potential of computers and have been ahead of the curve in lock technology. Home and business owners will know the need of security for their property. It’s hard to feel confident about your security in Ipswich without all the changes present in security today. We are dedicated to making efficient, dependable recording devices which will meet everyone’s security means. We offer a wide range of services from installing controlled access points for card swipe technology and video recording devices to the most up to date alarm system detection to the best structured physical security products delivered and installed in Ipswich, available all day, every day. With over 20 years of experience we are here to stay, we look forward to working with you for all your security needs in Ipswich. Call us and find out how we can help protect your business in Ipswich. 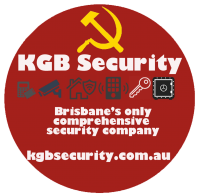 KGB Security Locksmiths was first created in 1987 by Geoff, Kel & Brock Phillips, starting out in Greenbank, the business moved twice before finally resting in 742 Beaudesert Rd Rocklea, in 2005. Our business started as a humble physical security and locksmith solutions company, but as the security needs of people evolved we evolved with them and moved into safes and vaults. In the year of 2005 we were given the title of one of Brisbane’s only Chubb Safes Premium Dealerships. In 2007 we formed KGB Security Electronics to handle the demand for emerging electronic security technology. John Lent spearheaded the division and with 30 years in the industry he was great choice. John brought experience which let us offer cutting edge solutions at our security company. Being on top of trends is important in our industry that’s why we are still expanding our CCTV as a featured area of the business. Presently we are working on providing a “stand alone” access control system to give any large remote site in South East Queensland a great solution in wireless security. Our business is full of dedicated people that understand the importance of home security. This gives us a great understand of what our customer want, so we can better match your needs. It’s vital as a company for us to give back to the community we are a part of, that’s why our locksmith division works with the local TAFE campus to help bring out industry knowledge to the masses. One of our founders Kel is involved with the Locksmiths Guild of Australia and in 2013 resigned his position as National President after a long term of 20 years. We are a member of the Master Locksmiths Association of Australia, and work closely with other security companies throughout Queensland Australia.